Now that the school year is in full swing here, I'm back to trying to be creative with school lunches. Ugh! Do you feel the pain as well? 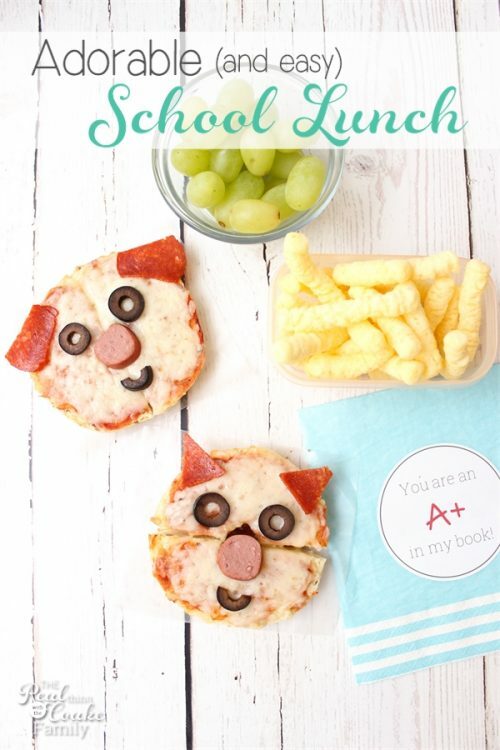 My youngest daughter and I came up with the most adorable lunch ideas and I've got them for you today. 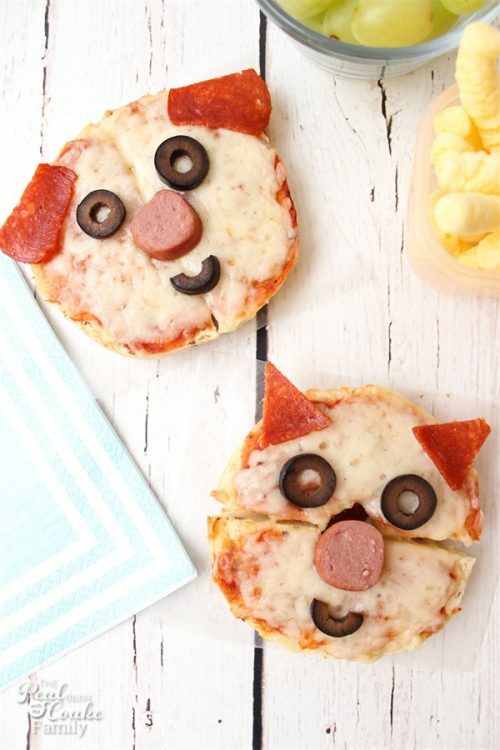 How about some adorable dog and cat bagel pizzas? 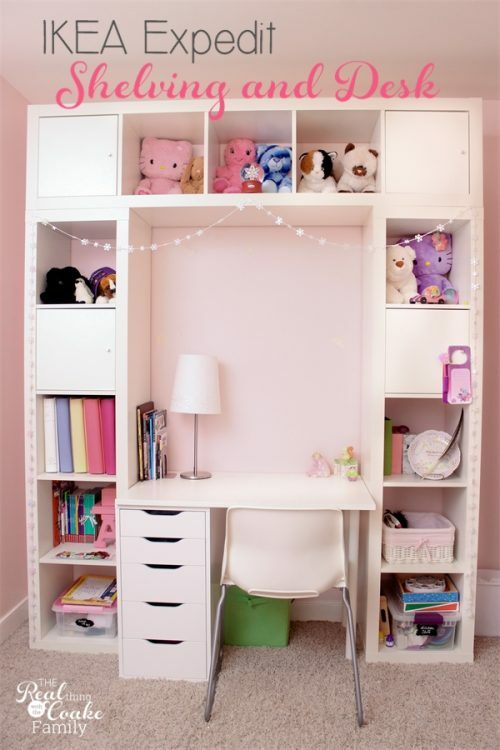 They are simple and easy to make and total cuteness. I was originally going to make a different bagel pizza lunch idea for you, but I didn't plan quite right when I went grocery shopping. Thank goodness I've got a super creative 8-year-old. She had set up a pet party for us and she really wanted our lunch to be part of the pet party. Therefore, we took what we had and created dog and cat bagel pizzas. They are perfect to fit in the lunch box…my middle schooler was totally bummed I didn't make one for her for the following day's lunch. 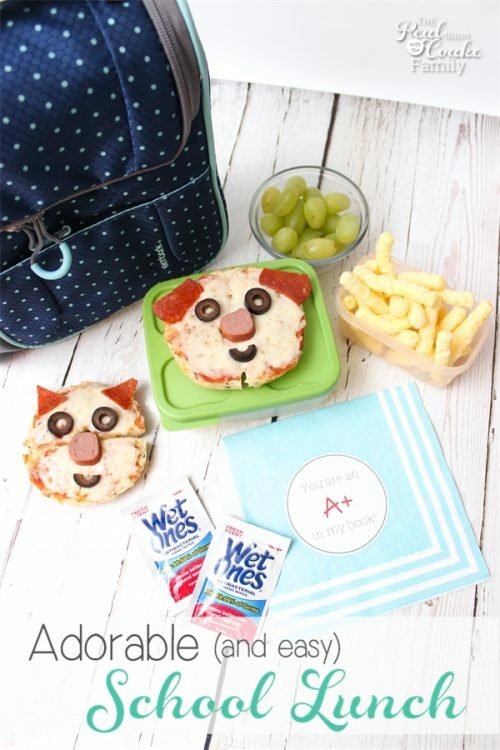 Dumb mom…I thought a middle schooler would be totally embarrassed by a cat or dog bagel pizza. She took the time to tell me she isn't like those kids who are embarrassed by things like that. 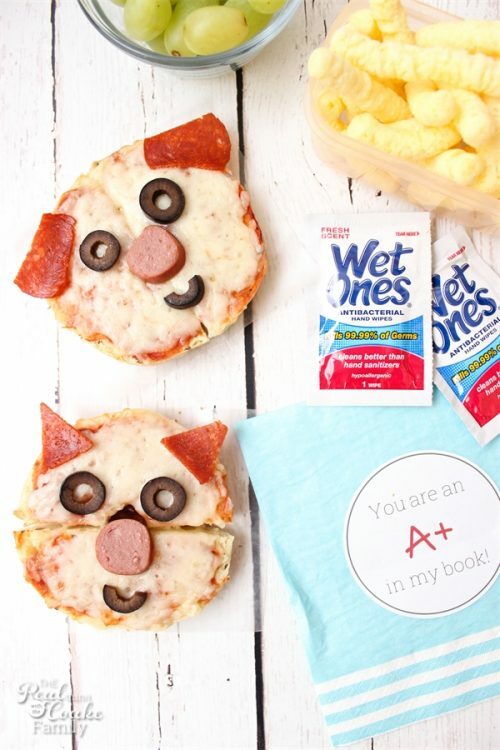 Okie Dokie…next time I will make you a dog or cat bagel pizza. 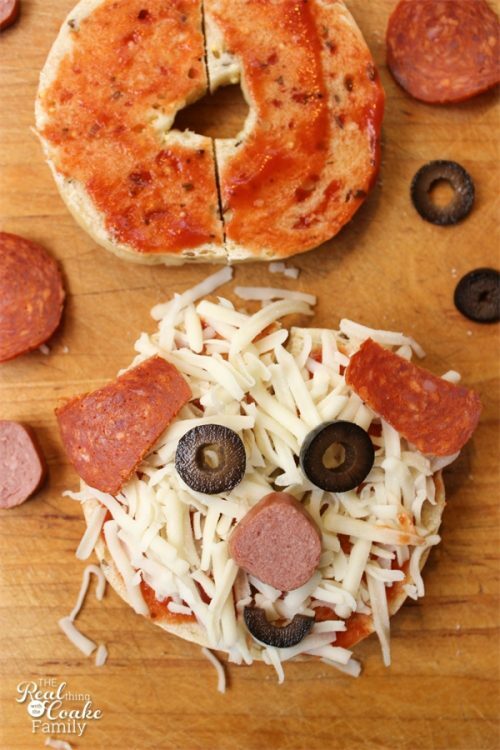 Anywho…how about if I show you how to make these easy and cute dog and cat bagel pizzas. 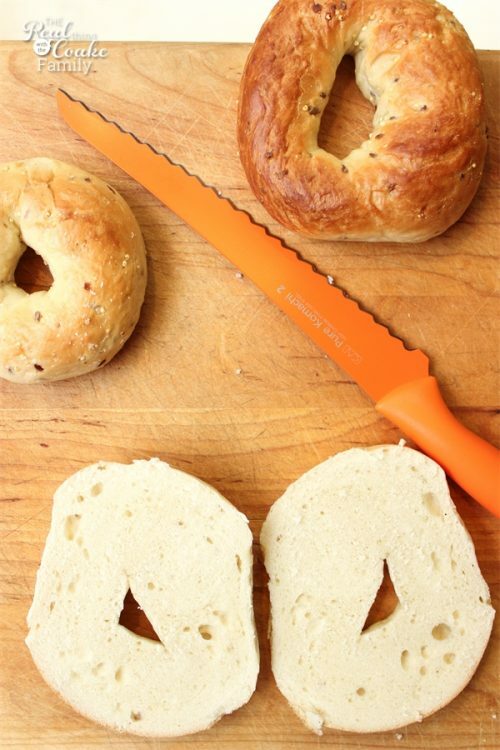 Start by cutting your bagel in half. Ignore how I cut the bagel into fourths. That is what I normally do to make the bagel pizzas into caterpillars, but I didn't have the pretzels to make the antennas, so just cut your bagel in half, not in fourths. You will want to put a thin layer of pizza sauce on the bagel as well as the shredded mozzarella. Don't put the face on yet or it will slide around while the pizza cooks. I just put it on to make sure it looked good. The main difference between the cat and the dog are the ears. Cut a small wedge off of each side of the pepperoni for the dog. Cut the pepperoni into a triangle shape for the cat's ears. 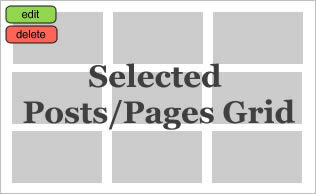 I have the full directions, cooking times, and temps in a download for you at the end of this post. Once the bagel pizza is cooked, add the face to your cat or dog. You could use pretzel sticks to make whiskers on the cat (I didn't have those or you would be seeing bagel pizza caterpillars right now). All in all this was a quick and easy lunch to make. 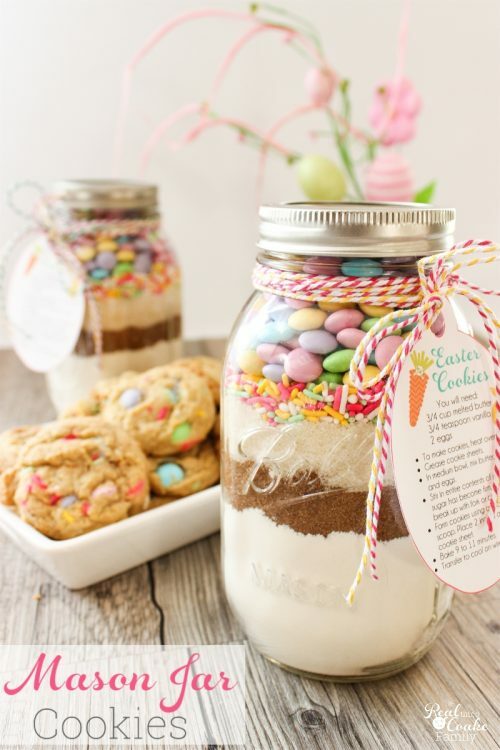 It is totally adorable and totally delicious as well. I didn't even feel guilty at eating a cat. Lol!